Asian culture and history span centuries. This is just a hint of the diversity and complexity. Animal signs are based on the Chinese Lunar New Year. To find your sign, just add 12 to your year of birth until you reach one of those listed. If you were born before the Chinese Lunar New Year, you'll need to subtract one year. Lunar New Year start dates and animal signs: 2016-8-Feb, Monday, Monkey; 2017-28-Jan, Saturday, Rooster; 2018-16-Feb, Friday, Dog; 2019-5-Feb, Tuesday, Pig; 2020-25-Jan, Saturday, Rat; 2021-12-Feb, Friday, Ox; 2022-1-Feb, Tuesday, Tiger; 2023-22-Jan, Sunday, Rabbit; 2024-10-Feb, Saturday, Dragon; 2025-29-Jan, Wednesday, Snake; 2026-17-Feb, Tuesday, Horse; 2027-6-Feb, Saturday, Goat, etc. 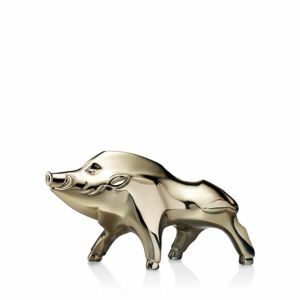 Celebrating 2019, the year of the Pig in Chinese astrology. The pig enriches Lalique's bestiary as a symbol of luck, wealth and loyalty. Gold-tone finish. 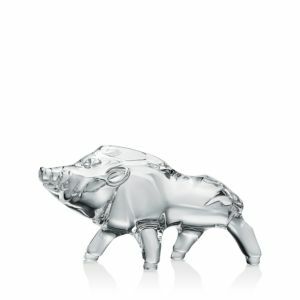 Crystal To celebrate 2019, the year of the Pig in Chinese astrology, Lalique created the pig sculpture. 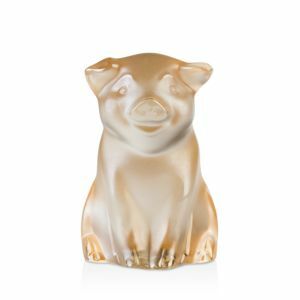 The pig enriches Lalique's bestiary as a symbol of luck, wealth and loyalty To celebrate 2019, the year of the Pig in Chinese astrology, Lalique created the pig sculpture. The pig enriches Lalique's bestiary as a symbol of luck, wealth and loyalty. The darling sculpture is accented with hand-painted 24-karat gold enamel. Handcrafted crystal pig hand-painted with 20-karat gold accents. As part of a growing series of lidded boxes representing animals from the Chinese zodiac, this piece embodies the diligence, compassion, and generosity of those born during the Year of the Pig. Represented as sincere and honest as it earnestly gazes upward, each piece captures the inherently happy spirit of the pig. "I love to design pieces that carry meaning and which can be given for special occasions across different cultures. The sculpt of the zodiac boxes each express the individual characteristics of the animal, and were sculpted fairly quickly so that the pieces would have a spontaneous quality to them." Chinese astrology celebrates 2017 as the year of the Rooster, which represents fidelity and punctuality. 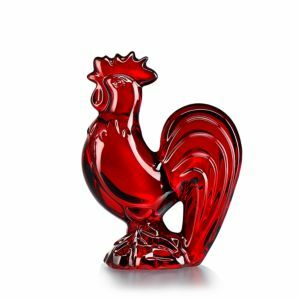 A charming figure for your desk or shelf, this small rooster is adorned with hand-applied gold accents. People born in the year of the rooster are observant, resourceful, courageous and talented. 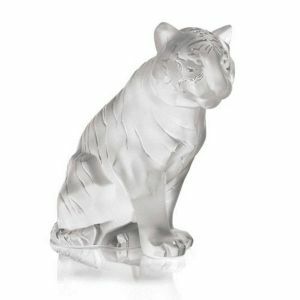 Offer an elegant nod to this loyal animal of the Chinese zodiac with Baccarat's beautifully detailed crystal decor. Handcrafted sculpture. Lead crystal. 4.5"T. Made in France. With the admirable traits of loyalty, honesty and kindness in mind, we crafted an ode to canine companions in brilliant glass, honoring their place in our hearts during this the Year of the Dog and every year. Handcrafted Golden Retriever. Realistically sculpted in gold-luster lead crystal. Handcrafted crystal snake. Hand-polished marble box features handcrafted 18-karat gold plated snake figurine on the lid. From the Compositions Collection. Hand-polished marble box features handcrafted 18-karat gold plated snake figurine on the lid. From the Compositions Collection. Handcrafted sculpture. Lead crystal. Handcrafted sculpture. Lead crystal. Approximately 2.25"W x 1.75"T. Made in France. Handcrafted sculpture. Lead crystal. Approximately 7"T. Made in France. The Kazak horse pays homage to one of the most majestic animals on Earth, the ultimate symbol of strength and speed. Crafted in clear crystal, the movement of the mane and tail flying in the wind is highlighted by hand-painted metallic. Crafted in black crystal, the movement of the mane and tail flying in the wind is highlighted by hand-painted platinum. Handcrafted monkey figures. Made of lead crystal. Handcrafted dragon figurine hand-painted with rhodium plating and antiqued finish. Handcrafted dragon figurine with an antiqued finish made of cast metal. Limited edition of 100. Hand-enameled and embellished with 14-karat gold plating and crystals. From the Luxe Collection. Handcrafted crystal dragon. The fifth animal in the Chinese zodiac, the dragon symbolizes life and power. The number 8—symbol of love and friendship, prudence and balance—is also the sign of light and represents the sun at its height with its image reflected below. Barclay Butera Lifestyle Emperor Rug Black Dragon Rugnylon. Rug design inspired by the culture-rich lands of the Far East. Power loomed of New Zealand wool/nylon. Handmade rug. Hand knotted of hand-spun wool. Black floral. Chinese guardian lions, also known as foo dogs, are believed to have strong mythic protective powers. They traditionally stood in front of Chinese Imperial palaces, Imperial tombs, government offices, temples, and the homes of government officials. They are always created in pairs, usually a male and a female with the male playing with a ball or orb and the female with a cub. Handcrafted sitting Buddha figure. Lead crystal.Made in France. A smaller version of the Baccarat best-selling gift, Little Buddha is a reproduction of a very traditional hand-carved wooden Buddha. Reclining Buddha figure of glowing amber crystal wears a wide grin on his round face. From Daum. 4"W x 2.5"T. Made in France. Lord Shiva, the Hindu god of meditation and the arts, in a sculpture made in High Porcelain, Lladró's maximum artistic category. A piece that boasts many complex decorative techniques, like golden luster, and a large amount of handmade flowers made petal by petal. Shiva's attributes are finely defined with a host of details enhancing his majestic character: the trident, the drum, the snake, the bands of Rudraksha and the bun in his hair. Lladró's artists have recreated the Hindu god of wisdom and knowledge in a winning combination of matte porcelain with enamels, golden luster in various different parts of the piece plus metallic effects paying tribute to the wealth of its iconography. Particularly outstanding is the highly elaborate ornamentation, which features an exquisite filigree work enriching every detail of the piece, including an elaborate garland of over 206 delicate flowers, one of the brand's signature elements. Auspicious symbols and homonyms were often incorporated in the decorative motifs of glazed porcelain. These pieces were often given as gifts for birthday or New Year's celebrations. Koi are symbols of courage, grace and perseverance according to a 3rd century Chinese book. Koi were introduced to Japan from China in the 1800's. If you are interested in using the principles of Feng Shui to change your life, it may be time for a home makeover. Feng Shui is the Chinese art of placement and using tools of the Feng Shui trade can change how your home feels. In Feng Shui, the thought is flow of energy will affect the way you feel in a space. We are all made up of the same stuff energetically, and since it is all around, it will affect us. Often energy is moving too quickly or it is stuck and you may feel drained or stuck in the mud if chi is out of balance in a space. Balance and harmony is what good Feng Shui is all about so how do you go about achieving just the right energetic mix for your home? When decorating your home with a Feng Shui eye, it takes part aesthetic taste and part common sense. Furniture should be good quality and the edges are best if rounded. If you think about a lot of points and sharp angles pointing at you all day that does not feel very good does it. Your furnishings do not have to appear as if you just came home from a trip to Hong Kong. However, having a few pieces of nice Asian furniture in the home is a very nice touch. Other good interior decorating pieces include temple or ginger jars. Art and accessories might include symbols such as the goldfish or peony blossom, as these call in wealth and luck. A great choice for additional softness and the use of the wood element include bamboo. Soft upholstery on sofas, chairs, pillows and more balance out sharp edges from wood. Painting a wall is an easy, inexpensive makeover for a room. Paint affirmations on the wall before a final coat with a new color. The “intention” of the affirmation will always be in the room supporting your goals. You do not have to see Feng Shui adjustments in order for them to work. Trust that they are serving you and forget them or make them a beautiful statement for the world to notice. It does not matter; Feng Shui works through intention, no matter what. Take a cue from the outdoors when deciding on your interior design theme. What colors of flowers are in your backyard? A nice balance is created if the indoor interior colors are reflected back when you look out the window. If you have mostly yellow daffodils, think about featuring yellows inside your home too. If pink roses and peonies is more your taste, these are very feminine flowers and the interior of the home is well served if it reflects these colors. Picture one of the scenarios in your mind’s eye and see if that “feels” good when you visually walk into the entrance of your home. Speaking of the entrance, a front door and entry area is very important in Feng Shui. Metaphorically speaking, all of the opportunity presented to you and your family comes from the Universe and enters your space through the front door. It is common sense to have round soft shapes in the entry as well so the opportunity feels welcome to enter. Round rugs or rugs with round designs promote a well-balanced entry as the energy is flowing at a good pace. I like using scent at the entrance too. Natural essential oils hold energy and scientifically promote either relaxation or rejuvenation. Choose from the many essential oils on the market and blend a unique scent for you and your guests to enjoy. Have a diffuser going at the front door and welcome all who enter (including opportunity) with a signature fragrance. If you like using Feng Shui in your life, try wearing good Feng Shui too. A red embroidered lotus jacket provides a graceful silhouette as well as some energy for your spirit. Jewelry and colors are very supportive to the body and spirit as a whole. For enhancing partnership, wear pink. For better health, wear yellow. For more money, wear shades of purples. For better career opportunities, wear black. If you love the look and feel of genuine gemstone, that is even better. Real stones hold an energetic vibration that supports the energy centers of the body. Fiery carnelian worn around the neck promotes fame and a good reputation. Any type of jade jewelry is supportive and lucky to wear. 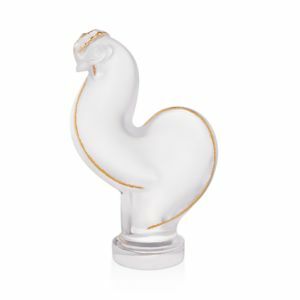 Metaphorical symbols are important in Feng Shui. A turtle bracelet signifies prosperity and long life. A lucky coin bracelet is a great source of good fortune and luck. Feng Shui will meet you where you are in this journey of life and lovingly support you along the way. Try bringing a little bit of Asia into your space, change things up with new colors that reflect the outdoors, or bring in more softness around you. Just shake things up and makeover your space to whatever suits you. Let Feng Shui support you towards a happier healthier life. Batiks are made using a wax-resistant dye technique developed in Java. The fabric is painted with melted wax and dipped in dye. The waxed areas resist the dye so that when the wax is removed with heat the design is revealed. The resulting fabric has a casual, Eastern feel that works well with bamboo and rattan furniture. Brocade: fabric with a raised pattern usually woven into silk. Probably first developed in China. Persian (Iranian) traditional brocades are made with gold and silver threads. Textiles were originally hand embroidered and the province of royalty reaching peak popularity during the 16th and 17th centuries. They are now usually machine embroidered. Chintz: Cotton fabric originating in India in the 1600's. Although the word comes from Hindi "chint" meaning spotted, it usually now has a floral design and glazed. Damask: Woven fabric usually with a matte pattern on shiny background created by using the same color in different weaves. The name comes from Damascus, Syria, where the fabric originates. Folk textiles: indigo and white fabrics made in preindustrial Japan for the general population who were prohibited from using the vibrant colors of the upper classes. Ikat (ee-kaht) is an ancient fabric usually associate with sarongs worn by Balinese royalty. Patterns of flowers, birds, stripes, etc., are produced by weaving tie-dyed silk or cotton threads. This technique is believed to have been separately developed by Japan, Argentina and India. Muslin: Cotton fabric originally made in Mosul, Iraq. It is lightweight and is often used for slipcovers. Paisley: Fabric with colorful, swirling teardrop designs first made in northern India and based on the tree of life design. The name comes from Scotland where the designs were used to make paisleys, or shawls. Dating back to the 1700's, Kashmiri weavers used fine cashmere from Himalayan mountain goats to create shawls with the swirly paisley patterns. They became a fashion craze in Europe when Napoleon brought them back to France for his wife, Empress Josephine in 1798. By the 1800's traders of the East India Company took the shawls home to Scotland where weavers in Paisley hand-blocked the designs and gave the pattern its name. In 1871 Scotland's Paisley Museum was founded. In 1875 Arthur Lasenby Liberty opens his shop in London selling hand-printed paisley cottons. Palampores: hand-painted panels with the tree of life motif from India. The patterns are very large and usually seen in wall hangings, spreads or bedspreads. Satin: woven fabric with a smooth, glossy side that reverses to dull, usually in silk, developed in China. Taffeta: a luxurious, stiff fabric made by weaving yarn alternatively over and under each warp yarn the entire length of the fabric. Indigo: According to expert Aboubakar Fofana, the blue hue results from fermentation of bacteria. He feeds them dates and honey. Dried leaves ferment in a vat for 9 months. Fabric is dipped, turns yellowish, then turns blue when removed and exposed to air as the indigo oxidizes and becomes colorfast. Some cultures believe it repels snakes and insects, some antiseptic power. Current style favorite Ikat is a Malay technique for printing woven fabric by tie dying either or both yarns before weaving. Ikat decor with a difference. Asia Pacific inspiration refreshes your room. Ikat (ee-kaht) is an ancient fabric usually associate with sarongs worn by Balinese royalty. Patterns of flowers, birds, stripes, etc., are produced by weaving tie-dyed silk or cotton threads. This technique is believed to have been separately developed by Japan, Argentina and India. Sake is one of the fastest growing beverage categories in the US. Sake literally means "alcoholic beverage." It's made from rice, but is brewed like beer. The better the quality of the rice, the better the sake. Premium sake is best served chilled. Light, clean sake with some citrus is usually paired with sushi and shellfish, while earthy, richer sake goes with noodles, mushrooms and meat.Perfect for sharing sake with friends, or a wonderful accompaniment to a meal of sushi or teriyaki. Great as a gift or addition to your own kitchen. Made in Japan. Simple and sophisticated, filled tokkuri (sake flasks) are often warmed by placing in a pan of hot water—the narrow neck helps retain heat. In Japan, sake cups (ochoko) are traditionally kept full by dining companions rather than poured for oneself.